As of August 31, 2018, the latest practicable date, 92,953,627 shares of the registrant's common stock, par value $0.01 per share, were issued and outstanding. The aggregate market value of the registrant's common stock, $0.01 par value, held by non-affiliates of the registrant as of December 29, 2017, the last business day of the registrant's most recently completed second fiscal quarter, was approximately $637.2 million, based upon the last reported sales price for such date on the NASDAQ Global Select Market. Portions of the registrant's proxy statement for the 2018 Annual Meeting of Stockholders are incorporated by reference into Part III hereof. This report contains references to a number of our trademarks (including services marks) that are registered trademarks or trademarks for which we have pending applications or common-law rights. Trade names, trademarks and service marks of other companies appearing in this Annual Report on Form 10-K are the property of their respective owners. This Annual Report on Form 10-K contains “forward-looking statements” that involve risks and uncertainties. You can identify forward-looking statements because they contain words such as “believes,” “expects,” “may,” “will,” “should,” “would,” “could,” “seeks,” “approximately,” “intends,” “plans,” “estimates,” or “anticipates” or similar expressions that relate to our strategy, plans or intentions. All statements we make relating to our estimated and projected earnings, margins, costs, expenditures, cash flows, growth rates, and financial results or to our expectations regarding future industry trends are forward-looking statements. In addition, we, through our senior management, from time to time make forward-looking public statements concerning our expected future operations and performance and other developments. These forward-looking statements are subject to risks and uncertainties that may change at any time and, therefore, our actual results may differ materially from those that we expected. We derive many of our forward-looking statements from our operating budgets and forecasts, which are based upon many detailed assumptions. While we believe that our assumptions are reasonable, we caution that it is very difficult to predict the impact of known factors and it is impossible for us to anticipate all factors that could affect our actual results. All forward-looking statements are based upon information available to us on the date of this Annual Report on Form 10-K.
We caution you that the foregoing list of important factors may not contain all of the material factors that are important to you. In addition, in light of these risks and uncertainties, the matters referred to in the forward-looking statements contained in this Annual Report on Form 10-K may not, in fact, occur. Moreover, we operate in a rapidly changing and competitive environment. New risk factors emerge from time to time, and it is not possible for management to predict all such risk factors. Accordingly, investors should not place undue reliance on those statements. We undertake no obligation to publicly update or revise any forward-looking statement as a result of new information, future events or otherwise, except as otherwise required by law. Presidio, Inc. (together with its subsidiaries, the "Company," "Presidio" or "we") is a leading provider of information technology (“IT”) solutions to the middle market in North America. We enable business transformation through our expertise in IT solutions for agile, secure infrastructure solution sets, with a specific focus on Digital Infrastructure, Cloud and Security solutions. Our solutions are delivered through a broad suite of professional services, including strategy, consulting, design and implementation. We complement our professional services with project management, technology acquisition, managed services, maintenance and support to offer a full lifecycle model. Our services-led, lifecycle model leads to ongoing client engagement. As of June 30, 2018, we serve approximately 8,000 middle-market, large, and government organizations across a diverse range of industries. Our clients are increasing dependent on Presidio to develop best of breed, vendor-agnostic agile, secure infrastructure solution sets comprised of Digital Infrastructure, Cloud, and Security solutions, which are described in more detail throughout this Annual Report on Form 10-K. Through our increasing focus agile, secure infrastructure sets, we believe we are well positioned to benefit from the rapid growth in demand for Digital Infrastructure, Cloud and Security technologies. Within our three solutions areas, we offer customers enterprise-class solutions that are critical to driving digital transformation and expanding business capabilities. Examples of such solutions include advanced networking, IoT, data analytics, data center modernization, hybrid and multi-cloud, cyber risk management and enterprise mobility. These solutions are enabled by our expertise in foundational technologies, built upon our investments in network, data center, security, collaboration and mobility. The middle market is a highly attractive segment of the IT services market, and we are differentiated by our strategic focus on this attractive segment. The increasing potential and complexity of emerging technologies and digital transformation are creating more demand for our solutions and services. Customers in the middle market are usually large enough to have substantial technology needs but typically have fewer IT resources and lack the broad expertise required to develop the necessary solutions as compared to larger companies. As a trusted solutions provider, our clients rely on us for IT investment decisions. We simplify IT for them by building solutions utilizing what we view as the best possible technologies. Since many large-scale IT service providers focus on larger enterprises, and because many resellers are unable to provide end-to-end solutions, we believe the middle market has remained underpenetrated and underserved. We develop and maintain our long-term client relationships through a localized direct sales force of approximately 500 employees based in over 60 offices across the United States as of June 30, 2018. As a strategic partner and trusted advisor to our clients, we provide the expertise to implement new solutions, as well as optimize and better leverage existing IT resources. We provide strategy, consulting, design, customized deployment, integration and lifecycle management through our team of over 1,600 engineers as of June 30, 2018, enabling us to architect and manage the ideal IT solutions for our clients. Our local delivery model, combining relationship managers and expert engineering teams, allows us to win, retain and expand our client relationships. Our client base is diversified across individual customers and industry verticals. In our fiscal year ended June 30, 2018, only 21% of our revenue was attributable to our top 25 clients by revenue and no industry vertical accounted for more than 19% of our revenue. Among the verticals that we serve, healthcare, government, financial services, education, and professional services are our largest categories. We believe that our diversified client profile is a key driver of our ability to generate growth across different economic and technology cycles. As of June 30, 2018, our backlog orders believed to be firm was approximately $582 million, compared to approximately $500 million as of June 30, 2017. Our backlog orders believed to be firm represents executed but unfulfilled client orders that we expect to result in actual revenue in future periods. The actual realization and timing of any of this revenue is subject to various contingencies, many of which are beyond our control, and such realization may never occur or may change because an order could be reduced, modified or terminated early. Due to these uncertainties, we estimate that approximately $144 million of our backlog orders believed to be firm as of June 30, 2018 will not be fulfilled within the current fiscal year. Refer to the "Risk Factors" section for additional information about risks concerning our backlog orders. Additional financial information about our business segments is provided in "Management's Discussion and Analysis of Financial Condition and Results of Operations" and the "Notes to Consolidated Financial Statements," which are included elsewhere in this Annual Report on Form 10-K.
We have a long history of expanding revenue from existing clients by selling additional solutions based on their evolving needs. We believe increasing complexity in the market combined with our end-to-end IT solutions and our high-touch, lifecycle approach, position us for continued growth. This approach has resulted in strong client satisfaction and increasing client engagement that we believe will enable us to continue expanding our revenue per client as our clients leverage our expertise to adopt emerging technologies. As middle-market businesses embrace cloud capabilities and enhance digital security, we believe we are well positioned to capture increased spend from our existing client relationships. We believe the diverse and fragmented nature of the North American IT services market provides us with a significant opportunity to further grow our client base. We have developed domain expertise managing complex technologies and vertical specific-challenges, which makes us a compelling choice for potential clients looking for an IT solutions partner. Our efforts to develop new client relationships are supported by our existing, referable client base. With our technological capabilities and proven record of success with clients, we are well positioned to acquire more clients as the need grows for consulting, deployment, integration and managed services. We also conduct highly coordinated marketing and sales activities using the strength of the Presidio brand to win new clients and penetrate highly localized markets. In these markets, we are well positioned against smaller regional IT providers who lack the resources to invest in increasingly advanced IT solutions. We focus on providing our clients with the highest quality, optimal solutions for their complex IT needs. We have developed innovative solutions for our clients across technology cycles and are currently developing and providing solutions based on emerging IT trends. Digital Infrastructure, Cloud and Security are some of the fastest growing areas of IT spend and we are focused on developing and deploying new solutions to serve these markets. For example, Presidio Concierge offering and our Next Generation Risk Management (“NGRM”) security offering help solve complex IT problems associated with these trends resulting in agile, secure infrastructure platforms. Through our national team of engineers, we maintain institutional knowledge and services capabilities that are adaptable, scalable, and transferable. We are constantly improving our offerings and developing new services and solutions for our clients, which we expect to drive incremental growth from existing and new clients. We have been expanding our geographic footprint in North America organically and inorganically and see new opportunities in several major regions. We take a deliberate and strategic approach to deciding which markets to pursue and consider a number of factors. Our expertise and solutions are scalable from region to region, so as we continue to expand we expect to take market share and create opportunities in new markets. We expect to continue to consider strategic acquisitions that can increase our technology expertise and geographic presence. We believe that our M&A strategy enhances and augments all of our growth avenues, including gaining capabilities, cross-selling to our existing clients and entering new markets and verticals. Since 2004, we have acquired and successfully integrated twelve companies, capitalizing on our scale, client relationships and vendor partnerships to drive margin expansion post-acquisition. In 2015, we acquired Sequoia Worldwide, LLC ("Sequoia"), a consulting, integration, and services company headquartered in California, which provided us with improved cloud consulting and integration capabilities. In 2016, we acquired Netech Corporation, an IT solutions provider headquartered in Michigan, which provided us with 11 offices to penetrate significant opportunities in the Midwestern United States. During our fiscal year ended June 30, 2018, we completed two acquisitions. In August 2017, we acquired Emergent Networks, LLC ("Emergent"), an IT solutions provider which expanded our geographic footprint into Minnesota and, in April 2018, we acquired Red Sky Solutions, LLC ("Red Sky"), which expanded our presence in the southwestern United States. We have been successful at integrating our acquisitions and retaining key management talent. These acquisitions are complementary with new office openings and the organic expansion of our presence in existing geographic markets. We expect to continue to selectively pursue acquisition opportunities within the highly fragmented IT solutions market, with a focus on enhancing our solutions offerings and geographic presence. Large Service Providers: Global service providers have scale and consulting capabilities but are not middle-market focused and generally do not provide all aspects of the IT value chain. We combine the scale, talent, technical expertise, and high-value services of the large service providers with end-to-end solution capabilities and a strategic middle-market focus. Local and Regional Providers: Though local and regional providers often have strong local relationships, many of them have historically been focused on one or two IT areas. As IT complexity has increased, these providers have attempted to transition from a siloed approach toward a multi-technology and multi-vendor approach. However, the relatively small scale of local and regional providers makes investments across multiple, integrated technology stacks financially prohibitive and, as a result, these competitors are increasingly getting left behind as they lack the professional and managed services capabilities in digital infrastructure, cloud, IoT, and cybersecurity. Also, lack of capability and financial scale often excludes these providers from executing on larger, multi-geography projects and relationships and developing advanced services. Boutique Specialists: Many boutique specialists focus in one distinct solution area rather than developing deep capabilities across the full range of IT challenges facing clients today. These firms are also typically sub-scale in terms of geographic coverage limiting their abilities to service larger, multi-location/multi-national customers. Our technical know-how across technologies and vendors, combined with our scale and broad client base, gives us the ability to deliver end-to-end offerings to much larger and more diverse end markets. As technologies continue to grow in complexity and interdependency, these providers will struggle to service client’s needs. Resellers: Rather than focusing principally on product resale, we focus on consulting, solution delivery, and ongoing services that allow us to develop long-lasting client relationships. Our lifecycle engagement model focuses on a holistic approach that includes high-value services and end-to-end solutions. AP VIII Aegis Holdings, L.P. (“Aegis LP”) holds most of our common stock. AP VIII Aegis Holdings GP, LLC (“Aegis GP”) is the general partner of Aegis LP, and Apollo Investment Fund VIII, L.P. (“Apollo VIII”) is one of the members of Aegis GP and as such has the right to direct the manager of Aegis GP in its management of Aegis GP. Apollo Management VIII, L.P. ("Management VIII") serves as the non-member manager of Aegis GP and as the investment manager of Apollo VIII. AIF VIII Management LLC ("AIF VIII LLC") serves as the general partner of Management VIII. Apollo Management, L.P. (“Apollo Management”) is the sole member and manager of AIF VIII LLC, and Apollo Management GP, LLC (“Apollo Management GP”) is the general partner of Apollo Management. Apollo Management Holdings, L.P. (“Management Holdings”) is the sole member and manager of Apollo Management GP and Apollo Management Holdings GP, LLC (“Management Holdings GP”) is the general partner of Management Holdings. Leon Black, Joshua Harris and Marc Rowan are the managers, as well as executive officers, of Management Holdings GP. Founded in 1990, Apollo Global Management, LLC (together with its consolidated subsidiaries, "Apollo") is a leading global alternative investment manager with offices in New York, Los Angeles, Houston, Chicago, St. Louis, Bethesda, Toronto, London, Frankfurt, Madrid, Luxembourg, Mumbai, Delhi, Singapore, Hong Kong and Shanghai. As of March 31, 2018, Apollo had assets under management of approximately $247 billion in private equity, credit and real estate funds, invested across a core group of nine industries in which Apollo has considerable knowledge and resources. For more information about Apollo, please visit www.agm.com. Information contained on Apollo’s website is not intended to form a part of or be incorporated by reference into this Annual Report on Form 10-K. The PRESIDIO® trademark and certain variations thereof are registered or are the subject of pending trademark applications in the U.S. We believe our trademarks have significant value and are important factors in our marketing programs. In addition, we own registrations for domain names, including presidio.com and certain other domains, for certain of our primary trademarks. We also have pending U.S. patent applications related to our cloud management solution known as Presidio Managed Cloud, which is now part of Presidio Concierge. No patents have been issued from these applications yet and the likelihood of receiving patent protection based on these applications is not yet clear. Once issued, a patent generally has a term of 20 years from the date the application for the patent is filed. Seeking patent protection is part of our strategy for competitively differentiating our hybrid cloud solution, but patent protection is not essential to our company as a whole or to our Presidio Managed Cloud or Presidio Concierge business. As of June 30, 2018, we had approximately 2,900 full-time employees in 68 locations across the United States. Included in this total is a localized direct sales force of approximately 500 employees as well as a team of over 1,600 engineers. As of June 30, 2018, none of our employees were covered by a collective bargaining agreement. Known originally as Integrated Solutions, LLC, Presidio was capitalized by an investor group in 2003 to address the need for an elite professional services firm that was focused on providing advanced technology solutions to middle-market businesses. Our early focus was to expand our regional presence and skill set expertise through both organic growth and acquisitions. By 2010, we had completed six acquisitions that complemented our core competencies, helping expand Presidio’s presence to 33 offices in 18 states. On February 2, 2015, certain investment funds affiliated with or managed by Apollo and its subsidiaries, including Apollo VIII, along with their parallel investment funds (the "Apollo Funds") acquired Presidio Holdings Inc., at which time Presidio Holdings Inc. became a direct wholly-owned subsidiary of the Company. We applied the acquisition method of accounting that created a new basis of accounting for the Company as of that date. On March 15, 2017, the Company completed an initial public offering (“IPO”) in which the Company issued and sold 18,766,465 shares of common stock, inclusive of 2,099,799 shares issued and sold on March 21, 2017 pursuant to the underwriters’ option to purchase additional shares, at the public offering price of $14.00 per share. The Company received net proceeds of $247.5 million, after deducting underwriting discounts and commissions from the sale of its shares in the IPO. On November 21, 2017, the Company completed a secondary public offering of 8,000,000 shares of the Company’s common stock by certain funds affiliated with Apollo Global Management, LLC (the “Selling Stockholder”) at a price to the public of $14.25 per share. In addition, the underwriters to such secondary public offering purchased an additional 1,200,000 shares of common stock from the Selling Stockholder. The Company did not sell any shares and did not receive any proceeds from the offering. Our principal executive office is located at One Penn Plaza, Suite 2832, New York, New York 10119. Our telephone number is (212) 652-5700. We maintain an internet website at www.presidio.com. Information contained on our website is not part of this Annual Report on Form 10-K. Stockholders of the Company and the public may access our Annual Reports on Form 10-K, quarterly reports on Form 10-Q, current reports on Form 8-K, and amendments to these reports (if applicable) filed with or furnished to the SEC under the Securities Exchange Act of 1934, as amended, through the "Investor Relations" section of our website. You may also obtain a copy of these reports without charge by sending a written request to Presidio, Inc., One Penn Plaza, Suite 2832, New York, New York 10119, Attention: Corporate Secretary. This information is provided by a third party link to the SEC's online EDGAR database, is free of charge and may be reviewed, downloaded, and printed from our website at any time. Our SEC filings are also available directly from the SEC's website at www.sec.gov which contains reports, proxy and information statements and other information regarding issuers that file electronically. These reports, proxy statements and other information may also be inspected and copied at the SEC's Public Reference Room at 100 F Street, NE, Washington, D.C. 20549. Please call the SEC at 1-800-SEC-0330 for further information on the operation of the Public Reference Room. We also make available free of charge, through the "Investor Relations" section of our website under Corporate Governance, our Corporate Governance Guidelines, our Code of Business Conduct and Ethics, and the charters of our Audit Committee, Nominating and Corporate Governance Committee, and Compensation Committee of our Board of Directors. The information contained on our website is not being incorporated herein. Set forth below are certain risk factors that could harm our business, results of operations and financial condition. We could also face additional risks and uncertainties not currently known to the Company or that we currently deem to be immaterial. Any of the following risks, if realized, could materially and adversely affect our business, financial condition or results of operations. General economic conditions could adversely impact technology spending by our clients and put downward pressure on prices, which could adversely impact our business, financial condition or results of operations. Weak economic conditions generally, sustained uncertainty about global economic conditions, U.S. federal or other government spending cuts or a tightening of credit markets could cause our clients and potential clients to postpone or reduce spending on technology solutions, products or services. If our industry becomes more price-sensitive, these conditions could also result in customers demanding lower prices for our solutions. Any downward pressure on prices could affect our sales growth and profitability, which could adversely impact our business, financial condition or results of operations. Changes and innovation in the information technology industry may result in reduced demand for our information technology solutions. Our results of operations are influenced by a variety of factors, including the condition of the information technology industry and shifts in demand for, or availability of, information technology solutions. The information technology industry is characterized by rapid technological change and the frequent introduction of new products, product enhancements and new distribution methods or channels, each of which can decrease demand for current solutions or render them obsolete. In addition, demand for the solutions we sell to our customers could decrease if we are unable to adapt in areas like cloud technology, IaaS, SaaS, PaaS, SDN or other emerging technologies. Cloud offerings may influence our customers to move workloads to cloud providers, which may reduce the procurement of products and solutions from us. Changes in the information technology industry may also negatively impact the demand for our solutions, which could adversely impact our business, financial condition or results of operations. Our financial performance could be adversely impacted if our federal, state and local government clients decrease their spending on technology products. We provide IT services to various government agencies, including federal, state and local government entities. For the fiscal year ended June 30, 2018, 10% of our revenue came from sales to state and local governments and 4% of our revenue was derived from sales to the federal government. These sales may be impacted by government spending policies, budget priorities and revenue levels. While our sales to public sector clients are diversified across various agencies and departments, an across-the-board change in government spending policies, including budget cuts at the federal level, could result in our public sector clients reducing their purchases and terminating their service contracts, which could adversely impact our business, financial condition or results of operations. Our solutions business depends on our vendor partner relationships and the availability of their products. Our solutions depend on the resale of products that we purchase from vendor partners, which include OEMs, software publishers and wholesale distributors. Under our agreements with our vendor partners, we are authorized to sell all or some of their products in connection with our end-to-end solutions, such as pre- and post-sales network design, configuration, troubleshooting and the support and sale of complementary products and services. Our authorization with each vendor partner has specific terms and conditions with respect to product return privileges, purchase discounts and vendor partner programs and financing programs. These include purchase rebates, sales volume rebates, purchasing incentives and cooperative advertising reimbursements. However, we do not have any long-term contracts with our vendor partners and our agreements with key vendors may be terminable upon notice by any party. As such, from time to time, vendor partners may limit or terminate our right to sell some or all of their products, or change the terms and conditions under which we obtain their products for integration into our solutions. or significant delay in receiving benefits under these programs could adversely impact our business, financial condition or results of operations. If we are unable to timely react to any changes in our vendors’ programs, such as the elimination of funding for some of the activities for which we have been compensated in the past, such changes could adversely impact our business, financial condition or results of operations. While we purchase from a diverse vendor base, we have significant supplier relationships with our vendor partners Cisco Systems, Inc. (“Cisco”) and Dell Technologies, Inc. (“Dell/EMC”). For the fiscal year ended June 30, 2018, Cisco provided products that made up 64% of our purchases from all manufacturers, while Dell/EMC provided products that constituted 9% of our purchases from all manufacturers. Another significant vendor partner is Palo Alto Networks, Inc., which provided hardware products that generated 2% of our purchases from all manufacturers in the fiscal year ended June 30, 2018. Our portfolio has been heavily concentrated in Cisco products. Though we do not maintain a long-term contractual arrangement with Cisco, historically Cisco has held a leading position in the IT infrastructure market. The loss of, change in business relationship with or change in the behavior, including the timing of fulfillment, of Cisco, any of the other vendors named in this report or any other key vendor partners, or the diminished availability of their products, may impact the timing of our sales or could reduce the supply and increase the cost of the products we sell, eroding our competitive position. Our Systems Integrator Agreement with Cisco (the “Systems Integrator Agreement”) sets forth the terms and conditions for our purchase and licensing of various products and services from Cisco, serving as the master agreement for all material business transactions with Cisco. The Systems Integrator Agreement sets forth our obligations to maintain certain quality standards in the services we provide our customers and training standards for certain of our personnel in Cisco products, including incentives for our company to maintain high levels of certification in Cisco expertise, which is measured periodically. The Systems Integrator Agreement had an original term of one year and has been regularly extended since its effective date on May 14, 2002, including the most recent extension through August 31, 2019. The Agreement may be terminated by either party without reason by providing the other party with forty-five days’ written notice prior to termination, or by Cisco upon twenty days’ written notice if there are certain changes in control of our Company. Given the significance of our vendor partners to our business model, any geographic relocation of key distributors used in our purchasing model could increase our cost of working capital, which would have a negative impact on our business, financial condition or results of operations. Similarly, the sale, spin-off or combination of any of our vendor partners and/or of certain of their business units, including a sale or combination with a vendor with whom we do not have an existing relationship, could adversely impact our business, financial condition or results of operations. Our solutions depend on the innovation and adaptability of our vendor partners, as well as our ability to partner with emerging technology providers. The technology industry has experienced rapid innovation and the introduction of new hardware, software and services offerings, such as cloud-based solutions. We have been and will expect to continue to be dependent on innovations in hardware, software and services offerings, as well as the acceptance of these products by clients. If we are unable to keep up with changes in technology and new offerings-for example, by providing the appropriate training to our account managers, technology sales specialists and engineers-it could adversely impact our business, financial condition or results of operations. Because our solutions involve the resale of vendor products, our business depends on the ability of our vendor suppliers to develop and provide competitive hardware, software and other products. If our vendor partners cannot compete effectively against vendors with whom we do not have a supply relationship, our business, financial condition or results of operations could be adversely impacted. Further, we depend on developing and maintaining relationships with new vendors who can provide products and services in emerging areas of technology, such as cloud, security, mobility, data analytics, software-defined networking and the IoT. To the extent that we cannot develop or maintain relationships with vendors who provide desirable hardware, software and other services, it could adversely impact our business, financial condition or results of operations. Substantial competition could reduce our market share and significantly harm our financial performance. Our current competition includes large system integrators and resellers, such as Accenture, WWT, Dimension Data and DXC Technology; large value-added resellers, such as CDW Corporation and ePlus; local providers in the five regional markets in which we operate (North, South, Tri-State, West and North Central); manufacturers who sell directly to end users, such as Dell Technologies, HPE and Oracle; boutique solutions providers, such as Optiv, Cognizant Infrastructure Services; and newer born-in-the-cloud channel partners like 2nd Watch and Cloud Technology Partners. Strong performance by these competitors, the increasing number of services providers in the market and rapid innovation in our industry could erode our market share and adversely impact our business, financial condition or results of operations. We expect our competitive landscape to continue to change as new technologies are developed, resulting in increasingly short technology refresh cycles. Innovation could disrupt our business model and create new and stronger competitors. Some of our hardware and software vendor partners sell and could intensify their efforts to sell their products directly to our clients. For example, ERP systems vendors and other major software vendors increasingly sell their procurement and asset management products along with their application suites. Because of their significant installed client base, these ERP vendors may have the opportunity to offer additional products to existing clients. Further, traditional OEMs have increased their services capabilities through mergers and acquisitions with services providers, which could potentially increase competition in the market to provide clients with comprehensive technology solutions. Any of these trends could adversely impact our business, financial condition or results of operations. Some solutions providers in our industry compete on the basis of price. To the extent that we face increased competition to gain or retain clients, we may be required to reduce prices, increase advertising expenditures or take other actions that could impact our cash flows. If we are forced to reduce prices and in doing so we are unable to attract new clients or sell increased quantities of products, our sales growth and profitably could be negatively affected, which could adversely impact our business, financial condition or results of operations. Our earnings could be affected if we lose several larger clients. Generally, our contracts with our clients are nonexclusive agreements that are terminable upon either party’s discretion with 30 days’ notice. Only certain of our client agreements require longer periods of notice (60 days’ to 90 days’ notice). As of June 30, 2018, we have approximately 8,000 middle-market, large, and government clients across a diverse range of industries. In our fiscal year ended June 30, 2018, 21% of our revenue was attributable to our top 25 clients (measured by revenue generated by client). Further, we do not have guaranteed purchasing volume commitments from our clients. As a result, the loss of several of our larger clients, the failure of such clients to pay amounts due to us or a material reduction in purchases made by such clients could adversely impact our business, financial condition or results of operations. The success of our business depends on the continuing development, maintenance and operation of our information technology systems. maintain our cost-efficient operating model while expanding our business in revenue and in scale. Disruption or breaches of security in our information technology systems and the misappropriation of our clients’ data could impair our reputation, expose us to liability and adversely impact our business. Our information technology systems are vulnerable to disruption by forces outside our control. We have taken steps to protect our information technology systems from a variety of internal and external threats, including computer viruses, network disruption, denial of service, corruption of data, malware, phishing, social engineering, unauthorized access and other malicious attacks, but there can be no guarantee that these steps will be effective. Any disruption to, or infiltration, of our information technology systems could adversely impact our business, financial condition or results of operations. In addition, in order to ensure customer confidence in our solutions and services, we may choose to remediate actual or perceived security concerns by implementing further security measures, which could require us to expend significant resources. could damage our reputation and our business, and could also expose us to legal claims, investigations, proceedings and liability and to regulatory penalties under laws that protect the privacy of personal information, any of which could adversely impact our business, financial condition, reputation or results of operations. Additionally, some of the hardware and software products we resell could have defects or otherwise be the subject of security breaches and other attacks. While we maintain insurance coverage that, subject to policy terms and conditions, is designed to address losses or claims that may arise in connection with certain aspects of data and cyber risks, such insurance coverage may be insufficient to cover all losses or all types of claims that may arise in the continually evolving area of data and cyber risk. We would consider the consequences of such attacks to be the responsibility of the respective manufacturers and publishers of such products; however, if such circumstances were to arise, we could be subject to litigation. Our managed services business requires us to monitor our clients’ devices on their network in varying levels of service. If we have not designed our systems to provide this service accurately or if there is a security breach in our system or the clients’ systems, we may be liable for claims. Increasing data privacy and information security obligations could also impose additional regulatory pressures on our clients’ businesses and, indirectly, on our operations. In response, some of our clients have sought and may continue to seek, to contractually impose certain strict data privacy and information security obligations on us. Some of our client contracts may not contractually limit our liability for the loss of confidential information. If we are unable to adequately address our clients' concerns, our business and results of operations could suffer. Compliance with new privacy and security laws, requirements and regulations may result in cost increases due to potential systems changes, the development of additional administrative processes and increased enforcement actions, fines and penalties. Any failure or perceived failure to comply or any misappropriation, loss or other unauthorized disclosure of sensitive or confidential information may result in proceedings or actions against us by government or other entities or private lawsuits against us, including class actions, which could adversely impact our business, financial condition, reputation and results of operations. Our investments in new services and technologies may not be successful. We have recently begun and continue to invest in new services and technologies, including cloud, security, mobility, data analytics, software-defined networking and IoT. The complexity of these solutions, our learning curve in developing and supporting them and significant competition in the markets for these solutions could make it difficult for us to market and implement these solutions successfully. There is further risk that we will be unable to protect and enforce our rights to use such intellectual property. Additionally, there is a risk that our clients may not adopt these solutions widely, which would prevent us from realizing expected returns on these investments. Even if these solutions are successful in the market, these solutions still rely on third-party hardware and software and our ability to meet stringent service levels; if we are unable to deploy these solutions successfully or profitably, it would adversely impact our business, financial condition or results of operations. If we infringe on the intellectual property rights of third parties, we may be subject to costly disputes or indemnification obligations that could adversely impact our business, financial condition or results of operations. We cannot assure you that our activities will not infringe on patents, trademarks or other intellectual property rights owned by others. If we are required to defend ourselves against intellectual property rights claims, we may spend significant time and effort and incur significant litigation costs, regardless of whether such claims have merit. If we are found to have infringed on the patents, trademarks or other intellectual property rights of others, we may also be subject to substantial claims for damages or a requirement to cease the use of such disputed intellectual property, which could have an adverse effect on our operations. Such litigation or claims and the consequences that could follow could distract our management from the ordinary operation of our business and could increase our costs of doing business, resulting in a negative impact on our business, financial condition or results of operations. Furthermore, third parties may assert infringement claims against our clients for infringement by our products on the intellectual property rights of such third parties. These claims may require us to initiate or defend protracted and costly litigation on behalf of our clients, regardless of the merits of these claims. We also generally extend the indemnification granted by our OEMs to our clients for any such infringement. If any of these claims succeed, we may be forced to pay damages on behalf of our clients or may be required to obtain licenses for the products they use, even though our OEMs may in turn be liable for any such damages. Any infringement on the intellectual property rights of third parties could adversely impact our business, financial condition or results of operations. Our engagements with our clients are based on estimated pricing terms. If our estimates are incorrect, these terms could become unprofitable. Some of our client contracts for professional services are fixed-price contracts to which we commit before we provide services to these clients. In pricing such fixed-price client contracts, we are required to make estimates and assumptions at the time we enter into these contracts that could differ from actual results. As a result, the profit that is anticipated at a contract’s inception may not be guaranteed. Our estimates reflect our best judgments about the nature of the engagement and our expected costs in providing the contracted services. However, any increased or unexpected costs, or any unanticipated delays in connection with our performance of these engagements—including delays caused by our third-party providers or by factors outside our control—could make these contracts less profitable or unprofitable and could have an adverse impact on our business, financial condition or results of operations. Failure to comply with the terms of our contracts with our public sector clients, or with applicable laws and regulations, could result in the termination of our contracts, fines or liabilities. Further, changes in government procurement regulations could adversely impact our business. We provide information technology services to various government agencies, including federal, state and local government entities, as well as international and intergovernmental agencies. Sales to such public sector clients are highly regulated. Any noncompliance with contract provisions, government procurement regulations or other applicable laws or regulations—including, but not limited to, the False Claims Act and the Foreign Corrupt Practices Act—could result in civil, criminal and administrative liability, such as substantial monetary fines or damages, the termination of government contracts or other public sector client contracts and suspension, debarment or ineligibility from doing business with the government and with other clients in the public sector. Our contracts with our public sector clients are terminable at any time at the convenience of the contracting agency or group purchasing organization (“GPO”). As such, our relationships with public sector clients are susceptible to government budget, procurement and other policies. Our inability to enter into or retain contracts with GPOs could threaten our ability to sell to current and potential clients in those GPOs. Further, the adoption of new or modified procurement regulations and other requirements may increase our compliance costs and reduce our gross margins, which could have a negative effect on our business, financial condition or results of operations. We also provide services to certain government agencies that require us to have and maintain security clearance at an appropriate level. If an acquisition or any other action we take causes us to lose our security clearance status, or results in our having a lower level of security clearance, we could lose the business of such clients, which could adversely impact our business, financial condition or results of operations. We rely on third-party companies to perform certain of our obligations to clients, which could impact our business if not performed. We deliver and manage mission-critical software, systems and network solutions for our clients. We also offer certain services, such as implementation, installation and deployment services, to our clients through various third-party providers who are engaged to perform these services on our behalf. We are also required, as a component of some of our contracts with our OEM partners, to utilize their engineers as part of our solutions. For the fiscal year ended June 30, 2018, 8% of our revenue was attributable to these third-party services. Further, to provide services to our clients outside of the United States, we rely heavily on an international network of preferred sales partners that are generally vetted by our OEM vendor partners. If we or our third-party services providers fail to provide high-quality services to our clients, or if such services result in a disruption of our clients’ businesses, we could be subject to legal claims, proceedings and liability. As we expand our services and solutions business, we may be exposed to additional operational, regulatory and other risks. For example, we could incur liability for failure to comply with the rules and regulations applicable to the new services and solutions we provide to our clients. Such issues could adversely affect our reputation with our clients, tarnish our brand or render us unable to compete for new work and could adversely impact our business, financial condition or results of operations. We rely on third-party commercial delivery services to provide products and services to our clients, which if not performed could lead to significant disruption to our business. We also depend heavily on commercial delivery services to provide products and services to our clients. For example, we generally ship hardware products to our clients by FedEx, United Parcel Service and other commercial delivery services and invoice clients for delivery charges. However, our inability to pass future increases in the cost of commercial delivery services to our clients could decrease our profitability. Additionally, strikes, inclement weather, natural disasters or other service interruptions by such shippers could affect our ability to deliver products to our clients in a timely manner and could adversely impact our business, financial condition or results of operations. Our business depends on our ability to attract and retain talented personnel. Our success depends on our ability to attract, develop, engage and retain key personnel to manage and grow our business, including our key executive, management, sales, services and technical employees. For example, as we seek to expand our offerings of value-added services and solutions, our success depends on attracting and retaining highly skilled technology specialists and engineers, for whom the market is extremely competitive. Increasingly, our competitors are requiring their employees to sign Non-Compete and Non-Solicitation agreements as part of their employment, making it more difficult for us to hire talented individuals with experience in our industry. We do not carry any “key man insurance”—that is, an insurance policy that would cover any financial loss that would arise from the death or incapacity of an important member of our business. Our failure to recruit and retain mission-critical employees could adversely impact our business, financial condition or results of operations. International trade laws and Anti-Corruption regulations and policies may adversely impact our ability to generate revenue from sales outside of the United States. A small portion of our revenue is derived from our sales outside of the United States, mostly from the non-U.S. activities of our clients based in the United States. Specifically, non-U.S. sales represented approximately 2.5% of our total revenue for the fiscal year ended June 30, 2018 compared to 2.3% for the fiscal year ended June 30, 2017. We are exposed to risk under international trade laws because of our sales derived from countries associated with higher risks of corruption and our use of third-party preferred agents to provide services to our clients outside of the United States. We have implemented a global anti-corruption policy that addresses U.S. laws and regulations governing Anti-Corruption and Anti-Bribery. However, our failure to implement guidance and procedures for specific situations as they arise, as well as inadequate training of our employees on these issues, could result in our inability to comply with international trade laws and regulations. We also export hardware and software that are subject to certain trade-related U.S. laws and regulations, including the Export Administration Regulations administered by the U.S. Department of Commerce, Bureau of Industry and Security (“BIS”) and various economic sanctions programs administered by the U.S. Treasury’s Office of Foreign Assets Control. Exports and re-exports of such hardware and software to certain countries in which we conduct business may require regulatory licensing or other authorization. Our failure to implement compliance policies and procedures, including those relating to product classification, licensing, and screening, or to adequately train our personnel to understand and comply with applicable regulations, could result in export or sanctions violations, which could have an adverse impact on our business, financial condition or results of operations. In June 2016, a majority of voters in the United Kingdom elected to withdraw from the European Union in a national referendum. The referendum was advisory and the terms of any withdrawal are subject to a negotiation period that could last years after the government of the United Kingdom formally initiates a withdrawal process. Nevertheless, the referendum has created significant uncertainty about the future relationship between the United Kingdom and the European Union, including with respect to the laws and regulations that will apply as the United Kingdom determines which European Union laws to replace or replicate in the event of a withdrawal. The referendum has also given rise to calls for the governments of other European Union member states to consider withdrawal. These developments, or the perception that any of them could occur, have had and may continue to have a material adverse effect on global economic conditions and the stability of global financial markets and may significantly reduce global market liquidity and restrict the ability of key market participants to operate in certain financial markets. Any of these factors could depress economic activity and restrict our access to capital, which could have a material adverse impact on our business, financial condition and results of operations. Interruption of the flow of hardware products from suppliers could disrupt our supply chain. product or component shortages or significant failures. We cannot predict whether the countries in which our products are purchased or manufactured, or may be purchased or manufactured in the future, will be subject to new or additional trade restrictions or sanctions imposed by the U.S. or other governments. Trade restrictions—including new or increased tariffs, quotas, embargoes, sanctions, safeguards and customs restrictions—against the products we sell, as well as foreign labor strikes, work stoppages or boycotts, could increase the cost or reduce the supply of the product available to us. We could experience, and have experienced in the past, periodic product shortages from our vendor partners if they fail to adequately project demand for certain products. Because we do not maintain hardware inventory that is not supported by executed client orders, except for insignificant spares, we depend on our vendor partners’ continued supply so we can fulfill our clients’ orders on a timely basis. A substantial disruption to our supply chain could adversely impact our business, financial condition or results of operations. We are exposed to accounts receivables and inventory risks. We extend credit to our clients for a significant portion of our revenue, typically on 30-day payment terms. As a result, we are subject to the risk that our clients will not pay for the products they have purchased or that they will pay at a slower rate than we have historically experienced. This risk is particularly pronounced during periods of economic downturn or uncertainty or, in the case of our public sector clients, due to governmental budget constraints. Though we devote resources to collections operations and have a low write-off rate, any failure or delay by our clients in paying for the products they have purchased could adversely impact our business, financial condition or results of operations. Any of our clients may experience a downturn in its business that may weaken its business, financial condition or results of operations. As a result, a client may fail to make payments when due, become insolvent or declare bankruptcy. Any client bankruptcy or insolvency, or the failure of any client to make payments when due, could result in losses. A client bankruptcy would delay or preclude full collection of amounts owed to us. In certain cases, we are able to return unused equipment to our vendors. We primarily acquire inventory once we have an agreement executed with a client and with the exception of an immaterial level of spare parts inventory, we do not generally maintain inventory that is not already designated for sale. However, we may be exposed to the risk that our inventory cannot be returned to the vendor in situations where a client cancels an executed order. We seek to minimize our inventory exposure through a variety of inventory management procedures and policies, including buying limits and restrictions on inventory purchase authority. However, if we were unable to successfully maintain our inventory management procedures and policies, or if there are unforeseen product developments that result in the more rapid obsolescence of our inventory, our inventory risks could increase, which could adversely impact our business, financial condition or results of operations. We may not be able to realize our entire investment in the equipment we lease. We are a lessor of technology equipment and the realization of equipment values (residual values) during the life and predominantly at the end of the term of a lease is an important element in our leasing business. At the inception of each lease, we record a residual value for the leased equipment based on our estimate of the value of the equipment at the expected disposition date. If the market value of leased equipment decreases at a faster rate than we projected, whether due to rapid technological or economic obsolescence, unusual wear and tear on the equipment, excessive use of the equipment or other factors, this would adversely affect the recoverability of the estimated residual values of such equipment. Further, certain equipment residual values are dependent on the vendor’s warranties, reputation and other factors, including market liquidity. We also may not realize the full market value of equipment if we are required to sell it to meet liquidity needs or for other reasons outside of the ordinary course of business. Consequently, there can be no assurance that we will realize our estimated residual values for equipment, which failure to realize such values could adversely impact our business, financial condition or results of operations. We may not realize the full amount of our backlog, which could have a material adverse impact on our business, financial condition or results of operations. As of June 30, 2018, our backlog orders believed to be firm was approximately $582 million, compared to approximately $500 million as of June 30, 2017. There can be no assurance that our backlog will result in actual revenue in any particular period, or at all, or that any contract included in our backlog will be profitable. This is because the actual realization and timing of any of this revenue is subject to various contingencies, many of which are beyond our control. The actual realization of revenue on engagements included in backlog may never occur or may change because an order could be reduced, modified or terminated early. Several of our orders involve the delivery of services that can be up to five years in duration and may be subject to delays in performance that are beyond our control. Due to these uncertainties, we estimate that approximately $144 million of our backlog orders believed to be firm as of June 30, 2018 will not be fulfilled within the current fiscal year. Our failure to realize the full amount of our backlog could adversely impact our business, financial condition or results of operations. Our acquisitions may not achieve expectations, which could affect our profitability. We have acquired, and may acquire, companies and operations that extend or complement our existing business. These transactions involve numerous business risks, including finding suitable transaction partners, the diversion of management’s attention from other business concerns, extending our product or service offerings into areas in which we have limited experience, entering into new geographic markets, the potential loss of key employees or business relationships and the integration of acquired businesses, any of which could adversely impact our business, financial condition or results of operations. Furthermore, failure to successfully integrate acquired operations may adversely affect our cost structure, reducing our gross margins and return on investment. In addition, we may acquire entities with unknown liabilities. Should an unknown liability emerge following an acquisition, it could adversely impact our business, financial condition or results of operations. As with most acquisitions in our industry, we paid a premium to book value in our prior acquisitions and the portion of the purchase price paid in excess of the fair value of the assets acquired has been recorded on our books as goodwill or intangible assets. We may be required to account for similar premiums paid on future acquisitions in the same manner. Under existing U.S. GAAP, goodwill is not amortized and is carried on our books at its original value, subject to annual review and evaluation for impairment, whereas finite-lived intangible assets are amortized over the life of the asset. If market and economic conditions (including business valuation levels and trends) deteriorate, we may have to record impairment charges to the extent the carrying value of our goodwill exceeds the fair value of our overall business. Additionally, if existing U.S. GAAP were modified to require amortization, such impairment charges or amortization expense could adversely affect our net earnings during the period in which the charge or expense is recorded. As of June 30, 2018, we had goodwill and other intangible assets related to our prior acquisitions of $1,504.0 million. Any failure to successfully integrate our acquisitions or a change to existing U.S. GAAP goodwill and intangible asset accounting policies could adversely impact our business, financial condition or results of operations. Our operating results could fluctuate significantly in the future because of industry factors and other factors outside of our control. Our operating results are dependent on a variety of industry factors, including the condition of the technology industry in general, shifts in demand and pricing for hardware, software and services and the introduction of new products or upgrades. Our operating results are also dependent on our level of gross profit as a percentage of revenue. Our gross profit percentage fluctuates due to numerous factors, some of which may be outside of our control. These include general macroeconomic conditions; pricing pressures; changes in product costs from our vendor partners; the availability of price protection, purchase discounts and incentive programs from our vendor partners; changes in product, order size and client mix; the risk that certain items in our inventory become obsolete; increases in delivery costs that we cannot pass on to clients; and general market and competitive conditions. Our results may be affected by slight variances as a result of seasonality we may experience across our business. This seasonality is typically driven by budget cycles and spending patterns across our diverse client base. For example, our local, state and federal government clients operate on an annual budget cycle, most often on the basis of a fiscal year that begins October 1. Our private sector clients operate on an annual budget cycle, most often on the basis of a fiscal year that begins January 1. It is not uncommon to experience a higher level of contract awards, funding actions and overall government and private demand for services in the final months and weeks of the government and private fiscal years, respectively. Consequently, our revenue in the first and second quarters of our fiscal year may be greater than the revenue recognized in the third and fourth quarters of our fiscal year. Furthermore, due to general economic conditions, we may not only experience difficulty in collecting our receivables on a timely basis but also may experience a loss due to a client’s inability to pay. In addition, certain economic factors may impact the valuation of certain investments we may make in other businesses. As a result of these and other factors, quarterly period-to-period comparisons of our financial results are not necessarily meaningful and should not be relied upon as an indication of future performance. In addition, our cost structure is based in part on anticipated sales and gross margins. Therefore, we may not be able to adjust our cost structure quickly enough to compensate for any unexpected sales or gross margin shortfall. Any such inability could adversely impact our business, financial condition or results of operations. We are exposed to risks from legal proceedings and audits. We are party to various legal proceedings that arise in the ordinary course of our business, which include commercial, employment, tort and other litigation. We are also subject to intellectual property infringement claims in the ordinary course of our business, which come in the form of cease-and-desist letters, licensing inquiries, lawsuits and other demands. These claims may arise either from the products and services we sell or the business systems and products we use to sell the products and services. In our industry, such claims have become more frequent with the increasing complexity of technological products. In fact, many of these assertions are brought by Non-Practicing entities, whose principal business model is to secure patent licensing revenue. Because of our significant sales to public sector clients, we are also subject to audits by federal, state and local authorities. From time to time, we receive subpoenas and other requests for information from various government authorities. We may also be subject to audits by various vendor partners and large clients, including government agencies, pursuant to certain purchase and sale agreements. Further, we may be required to indemnify our vendor partners and our clients from claims brought by third parties under certain agreements. Current and future litigation, infringement claims, governmental proceedings, audits or indemnification claims may result in substantial costs and expenses and regardless of the outcome, significantly divert the attention of our management, which could adversely impact our business, financial condition or results of operations. Changes in accounting rules could adversely affect our future financial results. We prepare our financial statements in conformity with U.S. GAAP. These accounting principles are subject to interpretation by the Financial Accounting Standards Board, the Public Company Accounting Oversight Board, the Securities and Exchange Commission, the American Institute of Certified Public Accountants and various other bodies formed to interpret and create appropriate accounting policies. Products and services and the manner in which they are bundled, are technologically complex and the characterization of these products and services require judgment to apply revenue recognition policies. Any mischaracterization of these products and services could result in misapplication of revenue recognition policies. Future periodic assessments required by current or new accounting standards may result in noncash changes and/or changes in presentation or disclosure. In addition, any change in accounting standards may influence our clients’ decision to purchase from us or to finance transactions with us, which could adversely impact our business, financial condition or results of operations. The impact of recent U.S. tax reform is uncertain. New U.S. federal tax legislation (commonly referred to as the “Tax Cuts and Jobs Act” or “TCJA”) was enacted in December 2017. This legislation made significant changes to the U.S. Internal Revenue Code, many of which are highly complex and may require interpretations and implementing regulations. As a result, we may incur meaningful expenses (including professional fees) as the new legislation is implemented. The expected impact of certain aspects of the legislation is unclear and subject to change, and could adversely impact our business, financial condition or results of operations. Increased costs of labor and employee health and welfare benefits may adversely impact our results of operations. Given our large number of employees, labor-related costs represent a significant portion of our expenses. Salaries, wages, benefits, commissions and other labor compensation costs (not including bonus and payroll tax) for our full-time employees amounted to $403 million, which represented approximately 69% of our selling, general and administrative expenses and approximately 6% of our cost of sales for the fiscal year ended June 30, 2018. An increase in labor costs (for example, as a result of increased competition for skilled labor) or employee benefit costs (such as health care costs or otherwise) could adversely impact our business, financial condition or results of operations. Our future results will depend on our ability to continue to focus our resources, maintain our business structure and manage costs effectively. We are continually implementing productivity measures and focusing on measures intended to further improve cost efficiency. We may be unable to realize all expected cost savings in connection with these efforts within the expected time frame, or at all, and we may incur additional and/or unexpected costs to realize them. Further, we may not be able to sustain any achieved savings in the future. Future results will depend on the success of these efforts. Under our contracts, should we be unable to control costs, we may incur losses, which could decrease our operating margins and significantly reduce or eliminate our profits. As our industry becomes more price-sensitive, our future profitability will depend on our ability to manage costs or increase productivity. An inability to effectively manage costs will adversely impact our business, financial condition or results of operations. Any failure in our delivery of high-quality technical support services may adversely affect our relationships with our clients and our financial results. Our clients depend on our services desk to provide technical support. We may be unable to respond quickly enough to accommodate short-term increases in client demand for support services. Increased client demand for these services, without corresponding revenue, could increase costs and adversely affect our operating results. In the same vein, any failure to maintain high-quality technical support, or a market perception that we do not maintain high-quality support, could adversely impact our reputation and our business, financial condition or results of operations. We may not meet our growth objectives and strategies, which may impact our competitiveness. On an ongoing basis, we seek to achieve profitable growth by providing superior solutions to our clients. As we continue to invest in growth opportunities, including our investments in new technologies and capabilities, we may experience unfavorable demand for these services and we may be unable to deploy these solutions successfully or profitably. In addition, we have historically been focused on reducing our costs and may not be able to achieve or maintain targeted cost reductions. Our inability to effectively invest in new growth opportunities or to reduce cost could impact our competitiveness and render it difficult for us to meet our growth objectives and strategies, which could adversely impact our business, financial condition or results of operations. Our internal control over financial reporting may not prevent or detect misstatements because of its inherent limitations, including the possibility of human error, the circumvention or overriding of controls or fraud. Even effective internal controls can provide only reasonable assurance with respect to the preparation and fair presentation of financial statements. If we fail to maintain the adequacy of our internal controls, including any failure to implement required new or improved controls, or if we experience difficulties in their implementation, our business and results of operations could be harmed and we could fail to meet our financial reporting obligations, which could adversely impact our business, financial condition or results of operations. Apollo and its affiliates currently have control over us, including the ability to elect all of our directors and prevent any transaction that requires approval of our Board of Directors or our stockholders and may also pursue corporate opportunities independent of us that could present conflicts with our and our stockholders’ interests. As of June 30, 2018, Aegis LP holds approximately 62% of our common stock. As a result, through Aegis LP and Apollo VIII, Apollo indirectly has the power to elect all of our directors. Therefore, Apollo effectively has the ability to prevent any transaction that requires the approval of our Board of Directors or our stockholders, including the approval of significant corporate transactions, such as mergers and the sale of substantially all of our assets. Thus, Apollo is able to significantly influence or effectively control our decisions. In addition, the stockholders’ agreement with Aegis LP that we entered into in connection with our IPO provides that, except as otherwise required by applicable law, if Aegis LP, Apollo VIII or other Apollo Funds hold (a) at least 50% of our outstanding common stock, they will have the right to designate up to five nominees to our Board of Directors, (b) at least 30% but less than 50% of our outstanding common stock, they will have the right to designate up to four nominees to our Board of Directors, (c) at least 20% but less than 30% of our outstanding common stock, they will have the right to designate up to three nominees to our Board of Directors and (d) at least 10% but less than 20% of our outstanding common stock, they will have the right to designate two nominees to our Board of Directors. The agreement provides that if the size of our Board of Directors is increased or decreased at any time, the nomination rights of the Apollo Funds will be proportionately increased or decreased, respectively, rounded up to the nearest whole number. The interests of Apollo could conflict with or differ from the interests of other holders of our common stock. For example, the concentration of ownership held by the Aegis LP could delay, defer or prevent a change of control of the Company or impede a merger, takeover or other business combination that a stockholder may otherwise view favorably. In addition, a sale of a substantial number of shares of stock in the future by Aegis LP or other Apollo Funds could cause our stock price to decline. Additionally, the group of (A) Apollo, (B) the Apollo Funds, (C) any other investment fund or other collective investment vehicle affiliated with or managed by affiliates of Apollo or whose general partner or managing member is owned, directly or indirectly, by Apollo and (D) any affiliate of the foregoing (in each case, other than the Company and its subsidiaries) (collectively, the “Apollo Group”) is in the business of making or advising on investments in companies and holds (and may from time to time in the future acquire) interests in or provides advice to businesses that directly or indirectly compete with certain portions of our business or are suppliers or customers of ours. The Apollo Group may also pursue acquisitions that may be complementary to our business and, as a result, those acquisition opportunities may not be available to us. Our certificate of incorporation provides that no officer or director of the Company who is also an officer, director, employee, managing director or other affiliate of any member of the Apollo Group will be liable to us or our stockholders for breach of any fiduciary duty by reason of the fact that any such individual pursues or acquires a corporate opportunity for its own account or the account of an affiliate, as applicable, instead of us, directs a corporate opportunity to any other person, instead of us or does not communicate information regarding a corporate opportunity to us. So long as the Apollo Funds continue to beneficially own a significant amount of our equity, even if such amount is less than 50%, the Apollo Funds may continue to be able to strongly influence or effectively control our decisions. The foregoing and other issues related to the Apollo Funds’ control of any of the foregoing may adversely impact prevailing market prices for our common stock. The price of our common stock may fluctuate significantly and you could lose all or part of your investment. material weakness in our internal controls over financial reporting. In addition, in recent years, the stock market has experienced significant price and volume fluctuations. This volatility has had a significant impact on the market price of securities issued by many companies. The changes frequently appear to occur without regard to the operating performance of the affected companies. Hence, the price of our common stock could fluctuate based upon factors that have little or nothing to do with the Company and these fluctuations may adversely impact prevailing market prices for our common stock. We are a “controlled company” within the meaning of applicable NASDAQ rules and, as a result, qualify for and rely on, exemptions from certain corporate governance requirements. that we have a nominating and governance committee composed entirely of independent directors with a written charter addressing the committee’s purpose and responsibilities. Accordingly, you will not have the same protections afforded to stockholders of companies that are subject to such corporate governance requirements of the NASDAQ. Our ability to pay regular dividends to our stockholders is subject to the discretion of our Board of Directors and may be limited by our agreements with third parties, our holding company structure and applicable provisions of Delaware law. If we do not pay dividends you may not receive funds without selling your common stock. Subject to certain conditions and limitations, we expect to pay cash dividends to the holders of our Common Stock on a quarterly basis. Any declaration and payment of future dividends to holders of our common stock may be limited by restrictive covenants of our debt agreements, will be at the sole discretion of our Board of Directors, will be subject to the applicable provisions of Delaware law and will otherwise depend on many factors, including our financial condition, earnings, capital requirements, level of indebtedness, statutory and contractual restrictions applying to the payment of dividends and other considerations that our Board of Directors deems relevant. in addition to those governing our current indebtedness, may not permit us to pay dividends on our common stock. Any of the foregoing may adversely impact prevailing market prices for our common stock. We are a holding company and we conduct all of our operations through our subsidiaries. As a result, we rely on our subsidiaries for dividends and other payments to generate the funds necessary to meet our financial obligations and to pay any dividends with respect to our common stock. Our ability to pay dividends will be subject to the applicable provisions of Delaware law that may limit the amount of funds available for distribution to our stockholders. In addition, each of the companies in the corporate chain must manage its assets, liabilities and working capital in order to meet all of its cash obligations, including the payment of dividends or distributions. Dividend payments are not mandatory or guaranteed; there can be no assurance that we will continue to pay a dividend in the future. Future sales or the possibility of future sales of a substantial amount of our common stock may depress the price of shares of our common stock. As of June 30, 2018, there were 92,853,983 shares of our common stock outstanding. This number includes 18,766,465 that were which were sold in our IPO and 9,200,000 shares that were sold in the November 2017 secondary offering and are freely transferable without restriction or further registration under the Securities Act of 1933, as amended (the “Securities Act”). Of the remaining 64,887,518 shares of our common stock outstanding, Aegis LP holds 57,800,000 shares representing approximately 62% of our outstanding shares. The shares owned by Aegis LP and certain of our executive officers may be sold pursuant to a prospectus supplement to the Prospectus included as part of the Registration of Form S-3 filed by the Company on April 26, 2018. Furthermore, shares held by our directors and our executive officers are eligible for resale subject to applicable volume and other restrictions under Rule 144 or pursuant to another applicable exemption under the Securities Act. The Company and Aegis LP, the Apollo Fund that holds most of our common stock, and certain of our employees who invested in the Company in connection with its acquisition by the Apollo Funds on February 2, 2015 are parties to a securityholders agreement (the “Amended Management Stockholders Agreement”). Pursuant to the Amended Management Stockholders Agreement, Aegis LP and certain of its affiliates have certain demand registration rights for shares of our common stock held by them. In addition, under the Amended Management Stockholders Agreement, Aegis LP, certain of its affiliates and certain owners of our common stock who are employed by or serve as consultants to or directors of our Company or any of its affiliates (the “Management Holders”) have piggyback and other registration rights with respect to shares of our common stock held by them. Furthermore, under the Amended Management Stockholders Agreement, we have agreed to indemnify (A) each party to the Amended Management Stockholders Agreement and their respective officers, directors, employees, representatives and each person who controls such party, (B) Aegis LP and its officers, managers, employees, representatives and affiliates and (C) any portfolio company of the Apollo Group against losses, claims, damages, liabilities and expenses caused by any untrue or alleged untrue statement of a material fact contained in any registration statement or prospectus or any omission or alleged omission to state therein a material fact required to be stated therein or necessary to make the statements therein not misleading, except insofar as the same may be caused by or contained in any information furnished in writing to our Company by such party set forth in (A), (B) or (C) above for use therein. We also may issue shares of our common stock or other securities from time to time as consideration for future acquisitions and investments. If any such acquisition or investment is significant, the number of shares of our common stock, or the number or aggregate principal amount, as the case may be, of other securities that we may issue may in turn be substantial. We may also grant registration rights covering those shares of our common stock or other securities in connection with any such acquisitions and investments. We cannot predict the size of future issuances of our common stock or the effect, if any, that future issuances and sales of our common stock will have on the market price of our common stock. Sales of substantial amounts of our common stock (including shares of our common stock issued in connection with an acquisition) or the exercising of any registration rights, or the perception that such sales or such exercising of registration rights could occur, may adversely affect prevailing market prices for shares of our common stock. Any of the foregoing may adversely impact prevailing market prices for our common stock. We filed a registration statement on Form S-8 under the Securities Act registering shares under the Presidio, Inc. 2017 Long-Term Incentive Plan, the Presidio, Inc. Amended and Restated 2015 Long-Term Incentive Plan and the Presidio, Inc. Employee Stock Purchase Plan. Subject to the terms of the awards pursuant to which shares are granted under the incentive plans and except for shares held by affiliates who will be subject to the resale restrictions described above, the shares issuable pursuant to our incentive plans will be available for sale in the public market. Delaware law and our organizational documents may impede or discourage a takeover, which could deprive our investors of the opportunity to receive a premium for their shares. establish advance notice requirements for nominations for election to our Board of Directors or for proposing matters that can be acted on by stockholders at stockholders’ meetings. Additionally, Section 203 of the Delaware General Corporation Law (the “DGCL”) prohibits a publicly held Delaware corporation from engaging in a business combination with an interested stockholder, generally a person, which together with any “interested” stockholder, or within the last three years has owned, 15% of our voting stock, for a period of which such person became an interested stockholder, unless the business combination is approved in a prescribed manner. We have elected not to opt out of Section 203 of the DGCL. We have included a provision in our certificate of incorporation that exempts us from the provisions of the DGCL with respect to combinations between any member of the Apollo Group (including any portfolio company thereof), on the one hand, and us, on the other. The foregoing factors, as well as the significant common stock ownership by Aegis LP could impede a merger, takeover or other business combination or discourage a potential investor from making a tender offer for our common stock, which, under certain circumstances, may adversely impact prevailing market prices for our common stock. Our certificate of incorporation provides that the Court of Chancery of the State of Delaware will be the sole and exclusive forum for substantially all disputes between us and our stockholders, which could limit our stockholders’ ability to obtain a favorable judicial forum for disputes with us or our directors, officers or employees. Our certificate of incorporation provides that, unless we consent in writing to the selection of an alternative forum, the Court of Chancery of the State of Delaware is the sole and exclusive forum for (a) any derivative action or proceeding brought on our behalf; (b) any action asserting a claim for or based on a breach of a fiduciary duty owed by any of our current or former directors or officers or other employees of the Company to the Company or to the Company’s stockholders, including a claim alleging the aiding and abetting of such a breach of fiduciary duty; (c) any action asserting a claim against the Company or any of our current or former directors, officers or other employees arising pursuant to any provision of the DGCL or our certificate of incorporation and bylaws; (d) any action asserting a claim related to or involving the Company that is governed by the internal affairs doctrine; or (e) any action asserting an “internal corporate claim” as that term is defined in Section 115 of the DGCL. The choice of forum provision may limit a stockholder’s ability to bring a claim in a judicial forum that it finds favorable for disputes with us or our directors, officers, or other employees, which may discourage such lawsuits against us and our directors, officers and other employees. Alternatively, if a court were to find the choice of forum provision contained in our certificate of incorporation to be inapplicable or unenforceable in an action, we may incur additional costs associated with resolving such action in other jurisdictions, which could adversely impact our business, financial condition or results of operations. We may issue shares of preferred stock in the future, which could make it difficult for another company to acquire us or could otherwise adversely affect holders of our common stock, which could depress the price of our common stock. Our certificate of incorporation authorizes us to issue one or more series of preferred stock. Our Board of Directors has the authority to determine the preferences, limitations and relative rights of shares of preferred stock and to fix the number of shares constituting any series and the designation of such series, without any further vote or action by our stockholders. Our preferred stock could be issued with voting, liquidation, dividend and other rights superior to the rights of our common stock. The potential issuance of preferred stock may delay or prevent a change in control of us, discouraging bids for our common stock at a premium to the market price and may adversely impact prevailing market prices for our common stock and the voting and other rights of the holders of shares of our common stock. We are a holding company and rely on dividends and other payments, advances and transfers of funds from our subsidiaries to meet our obligations. We are a holding company and we conduct all of our operations through our subsidiaries. As a result, we rely on our subsidiaries for dividends and other payments to generate the funds necessary to meet our financial obligations and to pay any dividends with respect to our common stock. The ability of our subsidiaries to pay dividends or to make other payments or distributions to us depends substantially on their respective operating results and is subject to restrictions under, among other things, the laws of their jurisdiction of organization, agreements of those subsidiaries, the terms of our financing arrangements and the terms of any future financing arrangements of our subsidiaries. Fulfilling our obligations incident to being a public company, including with respect to the requirements of and related rules under the Sarbanes-Oxley Act of 2002 and the Dodd-Frank Act, is expensive and time-consuming and any delays or difficulties in satisfying these obligations could have a material adverse effect on our future results of operations and our stock price. We are subject to reporting, accounting and corporate governance requirements of the NASDAQ, the Securities Exchange Act of 1934, as amended, the Sarbanes-Oxley Act and Dodd-Frank Wall Street Reform and Consumer Protection Act (“Dodd-Frank”). The Sarbanes-Oxley Act requires that we maintain effective disclosure controls and procedures and internal control for financial reporting. Under Section 404 of the Sarbanes-Oxley Act and pursuant to the terms therein, our independent public accountants auditing our financial statements must attest to the effectiveness of our internal control over financial reporting. To continue to maintain the effectiveness of our disclosure controls and procedures and internal control over financial reporting, significant resources and management oversight are required. To comply with the requirements of being a public company, we may need to undertake various actions, such as implementing new internal controls and procedures and hiring additional accounting or internal audit staff. In addition, we may identify control deficiencies which could result in a material weakness or significant deficiency. Furthermore, if we are unable to conclude that our disclosure controls and procedures and internal control over financial reporting are effective, or if our independent public accounting firm is unable to provide us with an unqualified report as to management’s assessment of the effectiveness of our internal control over financial reporting in future years, investors may lose confidence in our financial reports and our stock price may decline. In addition, Dodd-Frank, which amended the Sarbanes-Oxley Act and other federal laws, has created uncertainty for public companies and we cannot predict with any certainty the requirements of the regulations that will ultimately be adopted under Dodd-Frank or how such regulations will affect the cost of compliance for a company with publicly traded common stock. There is likely to be continuing uncertainty regarding compliance matters because the application of these laws and regulations, which are subject to varying interpretations, may evolve over time as new guidance is provided by regulatory and governing bodies. We intend to invest resources to comply with these evolving laws and regulations, which may result in increased general and administrative expenses and divert management’s time and attention from other business concerns. Furthermore, if our compliance efforts differ from the activities that regulatory and governing bodies expect or intend due to ambiguities related to interpretation or practice, we may face legal proceedings initiated by such regulatory or governing bodies and our business may be harmed. In addition, new rules and regulations may make it more difficult for us to attract and retain qualified directors and officers and may make it more expensive for us to obtain director and officer liability insurance. If securities analysts do not publish research or reports about our company, or if they publish unfavorable commentary about us or our industry or downgrade our common stock, the price of our common stock could decline. The trading market for our common stock depends in part on the research and reports that third-party securities analysts publish about our company and our industry. One or more analysts could downgrade our common stock or issue other negative commentary about our company or our industry. Alternatively, if one or more of these analysts cease coverage of our company, we could lose visibility in the market. As a result of one or more of these factors, the trading price of our common stock could decline. Our substantial indebtedness could impair our financial flexibility, competitive position and financial condition. We have a substantial amount of indebtedness and other obligations. As of June 30, 2018 we had $686.6 million in aggregate principal amount of total debt outstanding, comprised solely of term loan debt under our February 2015 Credit Agreement (without giving effect to undrawn letters of credit), and no obligations owed under our $250.0 million accounts receivable securitization facility. expose us to the risk of increased interest rates, as certain of our borrowings, including borrowings under our Credit Agreement and our accounts receivable securitization facility, are at variable rates of interest. In addition, the terms of the agreements governing our indebtedness contain restrictive covenants that limit our ability to engage in activities that may be in our long-term best interests. Our failure to comply with those covenants could result in an event of default, which, if not cured or waived, could result in the acceleration of our debts. The occurrence of any one of these events could adversely impact our business, financial condition or results of operations, as well as our prospects or ability to satisfy our debt obligations. In addition to the restrictions contained in our indebtedness, the agreements governing our accounts payable - floor plan facility also contain restrictive covenants that may limit our ability to engage in activities that may be in our long-term best interests. Our failure to comply with those covenants could result in the termination of our accounts payable - floor plan facility and the acceleration of our obligations thereunder. Despite our substantial indebtedness level, we may still be able to incur substantial additional amounts of debt that could further exacerbate the risks associated with our indebtedness. We and our subsidiaries may be able to incur substantial additional indebtedness in the future. Although the terms of our accounts receivable securitization facility and our Credit Agreement contain restrictions on our and our subsidiaries’ ability to incur additional indebtedness, these restrictions are subject to a number of important qualifications and exceptions and the indebtedness incurred in compliance with these restrictions could be substantial. For example, as of June 30, 2018, we had $50.0 million available for additional borrowing under the revolver of our Credit Agreement (without giving effect to letters of credit) and $248.0 million available under our accounts receivable securitization facility. These restrictions also will not prevent us from incurring obligations that do not constitute indebtedness. We may opportunistically raise debt capital, subject to market and other conditions, to refinance our existing capital structure or for strategic alternatives and general corporate purposes as part of our growth strategy. There can be no assurance that such debt capital will be available to us on a timely basis, at reasonable rates or at all. If new debt is added to our existing debt levels, the related risks that we face would intensify and we may not be able to meet all of our debt obligations. The agreements governing our debt contain, and future financing arrangements may contain, various covenants that limit our ability to take certain actions and require us to meet financial maintenance tests. Failure to comply with these terms could adversely impact our financial condition. sell assets or merge with other companies. Various risks, uncertainties and events beyond our control could affect our ability to comply with these restrictions and covenants. Failure to comply with any of the restrictions and covenants in our existing or future financing arrangements could result in a default under those arrangements and under other arrangements containing cross-default provisions. An event of default would permit lenders to accelerate the maturity of the debt under these arrangements and to foreclose upon any collateral securing the debt. Under such circumstances, we might not have sufficient funds or other resources to satisfy all of our obligations, including our debt obligations. In addition, the limitations imposed by our financing agreements on our ability to incur additional debt and to take other actions might significantly impair our ability to obtain other financing. To service our indebtedness and other cash needs, we require a significant amount of cash. Our ability to generate cash depends on many factors beyond our control. Our ability to satisfy our debt obligations and to fund any planned capital expenditures, dividends and other cash needs will depend in part upon the future financial and operating performance of our subsidiaries and upon our ability to renew or refinance borrowings. We cannot assure you that our business will generate cash flow from operations, or that we will be able to draw under our revolving credit facility or otherwise, in an amount sufficient to fund our liquidity needs, including the payment of principal and interest on our indebtedness. Prevailing economic conditions and financial, business, competitive, legislative, regulatory and other factors, many of which are beyond our control, will affect our ability to make these payments. negotiations with our lenders to restructure the applicable debt. to consummate those dispositions for fair market value, or at all. Furthermore, any proceeds that we could realize from any such dispositions may not be adequate to meet our debt service obligations then due. Our inability to generate sufficient cash flow to satisfy our debt obligations, or to refinance our indebtedness on commercially reasonable terms or at all, could adversely impact our business, financial condition or results of operation. Any decline in the ratings of our corporate credit could adversely affect our ability to access capital. Any decline in the ratings of our corporate credit or any indications from the rating agencies that their ratings on our corporate credit are under surveillance or review with possible negative implications could adversely impact our ability to access capital. We are subject to fluctuations in interest rates. Borrowings under our Credit Agreement and our accounts receivable securitization facility are subject to variable rates of interest and expose us to interest rate risk. For example, assuming the revolver under our February 2015 Credit Agreement and our accounts receivable securitization facility are fully drawn, and based on the outstanding term loan balance as of June 30, 2018, each 0.125% change in assumed blended interest rates would result in an approximately $1.2 million change in annual interest expense on indebtedness. At present, we do not have any existing interest rate swap agreements, which involve the exchange of floating for fixed rate interest payments to reduce interest rate volatility. However, we may decide to enter into such swaps in the future. If we do, we may not maintain interest rate swaps with respect to all of our variable rate indebtedness and any swaps we enter into may not fully mitigate our interest rate risk, may prove disadvantageous or may create additional risks. We lease all of our properties, which function primarily as regional sales and engineering offices. As of June 30, 2018, we leased space in 68 buildings across the United States. We believe that our current facilities are adequate to meet our ongoing needs and that, if we require additional space, we will be able to obtain additional facilities on commercially reasonable terms. We are involved in various claims and legal actions that arise in the ordinary course of business. While it is impossible to determine with certainty the ultimate outcome of these matters, in the opinion of management the ultimate disposition of these matters will not have a material adverse effect on our financial position, results of operations, or liquidity. The information set forth in Note 13, Commitments and Contingencies, to the consolidated financial statements is incorporated by reference herein. Prior to March 10, 2017, our common stock was privately held and there was no established public trading market for our common stock. On March 10, 2017, in connection with our IPO, our common stock began trading on the Nasdaq Global Select Market (the “NASDAQ”) under the symbol "PSDO." Our IPO was priced at $14.00 per share. The following table sets forth for the periods indicated, on a per share basis, the high and low sale prices for our common stock, as reported by the NASDAQ. As of August 31, 2018, there were 35 shareholders of record of our common stock. During the year ended June 30, 2018, we did not declare or pay any distributions to stockholders. However, on September 5, 2018, our Board of Directors declared an initial quarterly dividend of $0.04 per share of common stock, payable on October 5, 2018 to stockholders of record as of the close of business on September 26, 2018. We intend to declare quarterly dividends to holders of our common stock. However, any future declaration and payment of future dividends to holders of our common stock will be at the discretion of our Board of Directors and will depend on many factors, including our financial condition, earnings, capital requirements, level of indebtedness, statutory and contractual restrictions applying to the payment of dividends and other considerations that our Board of Directors deems relevant. Because we are a holding company and have no direct operations, we will only be able to pay dividends from our available cash on hand and any funds we receive from our subsidiaries. The terms of our indebtedness may restrict us from paying dividends, or may restrict our subsidiaries from paying dividends to us. Under Delaware law, dividends may be payable only out of surplus, which is our net assets minus our liabilities and our capital, or, if we have no surplus, out of our net profits for the fiscal year in which the dividend is declared and/or the preceding fiscal year. See "Risks Related to an Investment in our Common Stock — Our ability to pay regular dividends to our stockholders is subject to the discretion of our Board of Directors and may be limited by our agreements with third parties, our holding company structure and applicable provisions of Delaware law. If we do not pay dividends you may not receive funds without selling your common stock." The information contained under the section "Securities Authorized for Issuance under Equity Compensation Plans" in our Proxy Statement for the Annual Meeting of Stockholders is incorporated by reference herein. We did not repurchase any of our equity securities during the fourth quarter of fiscal 2018. This performance graph shall not be deemed “soliciting material” or to be “filed” with the SEC for purposes of Section 18 of the Securities Exchange Act of 1934, as amended (the “Exchange Act”), or otherwise subject to the liabilities under that Section, and shall not be deemed to be incorporated by reference into any filing of Presidio, Inc. under the Securities Act or the Exchange Act. The following graph presents the cumulative total stockholder return on our common stock as listed on the NASDAQ from March 10, 2017 (the date our common stock commenced trading on the NASDAQ) through June 30, 2018. 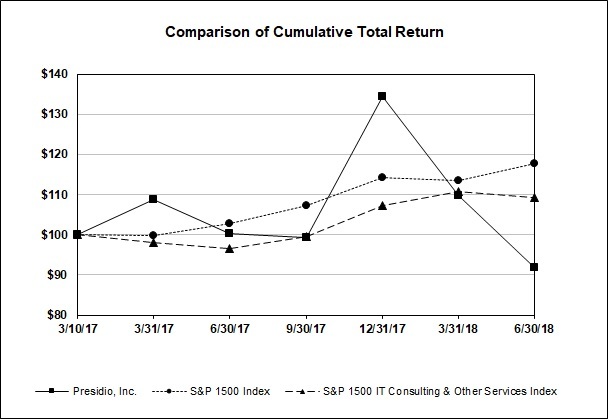 This graph also compares our common stock to the cumulative total stockholder return on the S&P 1500 Index and the S&P 1500 IT Consulting and Other Services Index. The graph assumes an initial investment of $100.00 in our common stock as of March 10, 2017 and in each of the comparative indicies or peer issuers, and that all dividends were reinvested. The comparisons in the graph below are based upon historical data and are not indicative of, nor intended to forecast, future performance of our common stock. The following table presents our selected historical consolidated financial data for all the periods presented. The selected historical consolidated statements of operations data for the fiscal years ended June 30, 2018, June 30, 2017 and June 30, 2016 and the selected historical consolidated balance sheet information as of June 30, 2018 and June 30, 2017 have been derived from our audited historical consolidated financial statements, included elsewhere in this Form 10-K. Our financial results with periods ending prior to February 2, 2015, have been termed those of "Predecessor," while the financial results with period ending subsequent to February 2, 2015, have been terms those of "Successor." The selected historical consolidated statements of operations data for the period from November 20, 2014 to June 30, 2015 (Successor), for the period from July 1, 2014 to February 1, 2015 (Predecessor) and the year ended June 30, 2014 and the selected historical consolidated balance sheet information as of June 30, 2016, 2015 and 2014 have been derived from our historical audited consolidated financial information, not included in this Annual Report on Form 10-K. In addition to financial information presented in accordance with U.S. GAAP, the following table presents Adjusted Revenue, Adjusted EBITDA, Adjusted EBITDA Margin, Adjusted Net Income and Adjusted Net Income Per Share (all of which are non-GAAP measures defined below). Our non-GAAP measures should be considered in addition to, not as a substitute for, or superior to, financial measures calculated in accordance with U.S. GAAP. They are not measurements of our financial performance under U.S. GAAP and should not be considered as alternatives to net income (loss) or revenue, as applicable, or any other performance measures derived in accordance with U.S. GAAP and may not be comparable to other similarly titled measures of other businesses. These non-GAAP measures have limitations as analytical tools and you should not consider them in isolation or as a substitute for analysis of our operating results as reported under U.S. GAAP and they include adjustments for items that may occur in future periods. Presidio, Inc. was incorporated on November 20, 2014 by certain investment funds affiliated with or managed by Apollo, including Apollo VIII, along with their parallel Apollo Funds in order to complete the acquisition of Presidio Holdings Inc. (the "Predecessor"). The Apollo Funds completed the acquisition on February 2, 2015 (the "Presidio Acquisition"), at which time Presidio Holdings Inc. became a wholly-owned subsidiary of Presidio, Inc. (the "Successor"). As a result of the Presidio Acquisition, the financial information for all periods ending on or after February 2, 2015 represent the financial information of the Successor. Periods ending prior to February 2, 2015 represent the financial information of the Predecessor. From November 20, 2014 (its date of inception) to February 1, 2015, the Successor had no operations or activities other than the incurrence of transaction costs related to the Presidio Acquisition. You should read the following information together with the consolidated financial statements and notes thereto in Item 8 of this report, "Risk Factors" in Item 1A of this report, "Management's Discussion and Analysis of Financial Condition and Results of Operations" in Item 7 of this report and our historical consolidated financial statements and related notes included in our previous filings. Historical results are not necessarily indicative of the results to be expected in the future. “Revenue from disposed business” represents the removal of the historical revenue of Atlantix prior to the sale of the business. “Purchase accounting adjustments” include the noncash reduction to revenue associated with deferred revenue step down fair value adjustments in connection with purchase accounting. “Total depreciation and amortization” equals the sum of (i) depreciation and amortization within total operating expenses and (ii) depreciation and amortization recorded as part of cost of revenue within our consolidated financial statements. “Purchase accounting adjustments” include charges associated with noncash adjustments to acquired assets and liabilities in connection with purchase accounting, such as recognition of increased cost of revenue in connection with an inventory step up fair value adjustment, recognition of reduced revenue in connection with a deferred revenue step down fair value adjustment and recognition of increased office rent expense associated with a fair value adjustment to the liabilities associated with deferred rent. “Transaction costs” (1) of $14.8 million for the fiscal year ended June 30, 2014 includes acquisition-related expenses of $0.8 million related to stay and retention bonuses, $0.3 million related to severance charges, $0.7 million related to transaction-related legal, accounting and tax fees and $13.0 million related to professional fees and expenses associated with debt refinancings; (2) of $42.6 million for the Predecessor period from July 1, 2014 to February 1, 2015 includes acquisition-related expenses of $0.3 million related to stay and retention bonuses, $0.2 million related to acquisition-related severance charges, $31.2 million related to transaction-related legal, accounting and tax fees in connection with the Presidio Acquisition and $10.9 million related to professional fees and expenses associated with debt refinancings; (3) of $21.3 million for the Successor period from November 20, 2014 to June 30, 2015 includes acquisition-related expenses of $0.6 million related to stay and retention bonuses, $0.6 million related to severance charges, $18.5 million related to transaction-related legal, accounting and tax fees in connection with the Presidio Acquisition and $1.6 million related to professional fees and expenses associated with debt refinancings; (4) of $20.6 million for the fiscal year ended June 30, 2016 includes acquisition-related expenses of $3.0 million related to stay and retention bonuses, $1.1 million related to severance charges, $8.7 million related to transaction-related advisory and diligence fees, $6.0 million related to transaction-related legal, accounting and tax fees and $1.8 million related to professional fees and expenses associated with debt refinancings; (5) of $14.8 million for the fiscal year ended June 30, 2017 includes acquisition-related expenses of $7.4 million related to stay and retention bonuses, $5.2 million related to transaction-related advisory and diligence fees, $0.5 million related to transaction-related legal, accounting and tax fees and $1.7 million related to professional fees and expenses associated with debt refinancings; and (6) of $10.8 million for the fiscal year ended June 30, 2018 includes acquisition-related expenses of $5.9 million related to stay, retention and earnout bonuses, $1.4 million related to transaction-related advisory and diligence fees primarily associated with the November 2017 secondary offering of our common stock, $0.6 million related to transaction-related legal, accounting and tax fees and $2.9 million related to professional fees and expenses associated with debt refinancings. “Other costs” (1) of $13.0 million for the fiscal year ended June 30, 2014 includes expenses of $3.7 million associated with the integration of previously acquired managed services platforms into one system, certain expenses of $1.1 million related to unusual office start-up development costs, an unusual and non-recurring loss of $1.7 million related to an Atlantix customer receivable, certain unusual legal expenses of $2.2 million, $2.1 million related to payments to our former sponsor for advisory and consulting services and $2.2 million related to certain acquisition-related integration and related costs; (2) of $4.5 million for the Predecessor period from July 1, 2014 to February 1, 2015 includes expenses of $2.2 million associated with the integration of previously acquired managed services platforms into one system, certain expenses of $0.4 million related to unusual office start-up development costs, $1.6 million related to payments to our former sponsor for advisory and consulting services and $0.3 million related to other non-recurring items; (3) of $1.9 million for the Successor period from November 20, 2014 to June 30, 2015 includes expenses of $1.0 million associated with the integration of previously acquired managed services platforms into one system, $0.7 million related to certain non-recurring costs incurred in the development of our new cloud service offerings and certain unusual legal expenses of $0.2 million; (4) of $5.6 million for the fiscal year ended June 30, 2016 includes expenses of $0.5 million associated with the integration of previously acquired managed services platforms into one system, $3.4 million related to certain non-recurring costs incurred in the development of our new cloud service offerings, certain expenses of $0.5 million related to unusual office start-up development costs and certain unusual legal expenses of $1.2 million; (5) of $4.8 million for the fiscal year ended June 30, 2017 includes $3.6 million related to certain non-recurring costs incurred in the development of our new cloud service offerings, certain unusual legal expenses of $0.9 million and $0.3 million related to other non-recurring items; and (6) of $1.1 million for the fiscal year ended June 30, 2018 primarily related to severance charges associated with the retirement of our former Chief Financial Officer. “Earnings from disposed business” represents the removal of the historical earnings contribution of Atlantix prior to the sale of the business. diligence fees, $0.5 million related to transaction-related legal, accounting and tax fees and $1.7 million related to professional fees and expenses associated with debt refinancings; and (6) of $10.8 million for the fiscal year ended June 30, 2018 includes acquisition-related expenses of $5.9 million related to stay, retention and earnout bonuses, $1.4 million related to transaction-related advisory and diligence fees primarily associated with the November 2017 secondary offering of our common stock, $0.6 million related to transaction-related legal, accounting and tax fees and $2.9 million related to professional fees and expenses associated with debt refinancings. “Income tax impact of adjustments” includes an estimated tax impact of the adjustments to net income at the Company’s average statutory rate to arrive at an appropriate effective tax rate on Adjusted Net Income, except for (i) the adjustment of certain transaction costs that are permanently nondeductible for tax purposes, (ii) the impact of tax-deductible goodwill and intangible assets resulting from certain historical acquisitions and further adjusted for discrete tax items, such as the remeasurement of deferred tax liabilities due to state effective tax rate changes or the excess tax benefit related to share-based compensation activity. Unless otherwise indicated or the context otherwise requires, as used in this “Management’s Discussion and Analysis of Financial Condition and Results of Operations,” the terms “we,” “us,” “the Company,” “our,” “Presidio,” and similar terms refer to Presidio, Inc. and its subsidiaries. You should read the following discussion in conjunction with the historical consolidated financial statements of Presidio, Inc. and its subsidiaries and the related notes included elsewhere in this Annual Report on Form 10-K. This discussion contains forward-looking statements and involves numerous risks and uncertainties, including, but not limited to, those described in "Item 1A. Risk Factors." Our actual results may differ materially from those contained in any forward-looking statements. The following is a discussion and analysis of our consolidated financial condition as of June 30, 2018 and 2017 and our consolidated results of operations for the fiscal year ended June 30, 2018, the fiscal year ended June 30, 2017 and for the fiscal year ended June 30, 2016 and significant factors which we believe could affect our prospective financial condition and results of operations. Presidio is a leading provider of IT solutions to the middle market in North America. We enable business transformation through our expertise in agile, secure infrastructure solutions, with a specific focus on Digital Infrastructure, Cloud and Security solutions. Our solutions are delivered through a broad suite of life-cycle services comprised of professional services and Managed/Optimization services. These services include strategy, consulting, design, implementation, project management, technology acquisition, managed infrastructure, cloud and security services, maintenance and support. Our services-led, lifecycle model leads to ongoing client engagement. For the fiscal year ended June 30, 2018, we served approximately 8,000 middle-market, large and government organizations across a diverse range of industries. Our clients are increasingly dependent on Presidio to develop best of breed, vendor-agnostic agile, secure infrastructure solution sets comprised of Digital Infrastructure, Cloud and Security solutions. Within these areas, we offer customers enterprise-class solutions that are critical to driving digital transformation and expanding business capabilities. Examples of our solutions include advanced networking, Software Defined Data Centers, IoT, data analytics, data center modernization, hybrid and multi-cloud, cyber risk management and enterprise mobility. These solutions are enabled by our expertise in foundational technologies, built upon our investments in network, data center, security, collaboration and mobility. Digital Infrastructure Solutions: Our enterprise-class Digital Infrastructure solutions enable clients to deploy IT infrastructure that is cloud-flexible, mobile-ready, secure and insight-driven. We also make clients’ existing IT infrastructure more efficient and flexible for emerging technologies. Within Digital Infrastructure, we are focused on networking, Software Defined networking, collaboration, enterprise mobility, IoT and data analytics. Given the millions of potential configurations across technologies, our clients rely on our expertise to simplify the highly complex IT landscape. Cloud Solutions: Companies are increasingly turning to us for help with their cloud strategy and adoption. We combine our highly specialized cloud professional services with our deep experience in cloud-managed services, converged infrastructure, server, storage, support and capacity-on-demand economic models to provide a complete lifecycle of cloud infrastructure solutions for our clients. Our proprietary tools, technical expertise and vendor-agnostic approach help our customers accelerate and simplify cloud adoption across the entire IT lifecycle. retail, education, healthcare, government, banking, pharmaceutical and others. We have expertise with HIPAA, PCI DSS, FISMA, the Sarbanes-Oxley Act and others. We help our clients design and implement information security programs consistent with industry best practices and comply with the regulatory mandates of their specific vertical that are flexible enough to help ensure information security in an ever-changing risk environment. Findings, recommendations and real time security posture status, including our proprietary Risk Management Score, are provided through a 7x24 portal that is accessible by our clients and is updated with the up to date vulnerabilities identified by several industry sources. We help our clients establish both technical and non-technical security controls and practices to prevent, detect, correct, and minimize the risk of loss or damage to information resources, disruption of access to information resources and unauthorized disclosure of information. In addition to our NGRM program, we offer options for security strategy program development, security awareness training, technology exposure assessments and incident response. We believe that the financial performance of our business and our future success are dependent upon many factors, including those highlighted in this section. Our operating performance will depend upon many variables, including the success of our growth strategies and the timing and size of investments and expenditures that we choose to undertake, as well as market growth and other factors that are not within our control. Macroeconomic environment: Weak economic conditions generally, U.S. federal or other government spending cuts, a rising interest rate environment, uncertain tax and regulatory policies, weakening business confidence or a tightening of credit markets could cause our clients and potential clients to postpone or reduce spending on technology solutions, products or services. Our clients are diverse, including both public and private sector parties, but any long-term, severe or sustained economic downturn may adversely affect all of our clients. Competitive markets: We believe that we are uniquely positioned to take advantage of the markets in which we operate because of our expertise and specialization. We focus on the middle-market segment of the IT services market. Since most large-scale IT service providers focus on larger enterprises and because smaller regional competitors are typically unable to provide end-to-end solutions, we believe the middle market is under-penetrated and under-served. Strategic and investment decisions by our competitors may affect our operating performance. Delivery of complex technology solutions: Our vendor agnostic approach to the market allows us to develop optimal IT solutions for our clients based on what we view as the best mix of technologies. We deliver our end-to-end solutions through a full lifecycle model, which combines consulting, engineering, managed services and technology to give us a significant competitive advantage compared to other IT providers. Our ability to effectively manage project engagements, including logistics, product availability, client requirements, engineering resources and service levels, will affect our financial performance. Vendor partner relationships: We are focused on developing and strengthening our partner relationships with original equipment manufacturers (“OEMs”). We partner with OEMs to deploy product offerings. Pricing and incentive programs are subject to change, and the loss of, change in business relationship with or change in the behavior, including the timing of fulfillment, of any key vendor partners, or the diminished availability of their products, may impact the timing of our sales or could reduce the supply and increase the cost of the products we sell. While we maintain existing relationships with large vendors, there is no guarantee that our vendor partners will continue to develop or produce information technology products that are popular with our clients. We maintain the ability to evolve our vendor relationships as necessary to respond to market trends. Seasonality: Our results may be affected by slight variances as a result of seasonality we may experience across our business. This seasonality is typically driven by budget cycles and spending patterns across our diverse client base. For example, our local, state and federal government clients operate on an annual budget cycle, most often on the basis of a fiscal year that begins October 1. Our private sector clients operate on an annual budget cycle, most often on the basis of a fiscal year that begins January 1. It is not uncommon to experience a higher level of contract awards, funding actions and overall government and private demand for services in the final months and weeks of the government and private fiscal years, respectively. The accompanying consolidated financial statements have been prepared in conformity with accounting principles generally accepted in the United States of America (“U.S. GAAP”). All financial information presented in the financial statements and notes herein is presented in millions except for share and per share information and percentages. In management’s opinion, all adjustments necessary for a fair presentation of the results of operations, financial position and cash flows for the periods shown have been made. With the exception of acquisition related accounting, all other adjustments are of a normal recurring nature. There are a number of factors that impact the revenue and margin profile of the solutions we provide, including, but not limited to, solution and technology complexity, technical expertise requiring the combination of products and value-added services provided, as well as other elements that may be specific to a particular engagement. Revenue and cost of revenue: Revenue from the sale of our solutions is primarily comprised of the sale of third-party products, software and third-party support service contracts along with the sale of Company and third-party services. We separately present product revenue and service revenue, along with the associated cost of revenue, in our consolidated statements of operations. Revenue for hardware and software: Revenue from the sale of hardware and software products is generally recognized on a gross basis with the selling price to the client recorded as revenue and the acquisition cost of the product recorded as cost of revenue, net of vendor rebates. Revenue is generally recognized when the title and risk of loss are passed to the client. Hardware and software items can be delivered to clients in a variety of ways including as physical products shipped from our warehouse, via drop-shipment by the vendor or supplier, or via electronic delivery for software licenses. In certain cases, our solutions include the sale of software subscriptions where we are the agent in the arrangement with the customer and recognize the related revenue net of the related cost of revenue. Revenue for third-party support service contracts: Revenue from the sale of third-party support service contracts is recognized net of the related cost of revenue. In a third-party support service contract, all services are provided by our third-party providers and as a result, we are acting as an agent and recognize revenue on a net basis at the date of sale, with revenue being equal to the gross margin on the transaction. As we are under no obligation to perform additional services, revenue is recognized at the time of sale as opposed to over the life of the third-party support service agreement. Revenue from leasing arrangements: Revenue recognition for information technology hardware and software products leased to clients is based on the type of the lease. Each lease is classified as either a direct financing lease, sales-type lease or operating lease. The majority of our leases are sales-type leases. At the inception of a sales-type lease, the present value of the non-cancelable rentals is recorded as revenue and equipment costs, less the present value of the estimated residual values, are recorded in cost of revenue. At the inception of an operating lease, the equipment assigned to the lease is recorded at cost as equipment under operating leases in our consolidated balance sheets and is depreciated on a straight-line basis over its useful life. Monthly payments are recorded as revenue within our consolidated statements of operations, with the depreciation expense associated with the equipment recorded in cost of product revenue. Revenue for professional services: Revenue for professional services is generally recognized as the services are performed. For time and material service contracts, revenue is recognized at the contractual hourly rates for the hours performed during the period. For fixed price service contracts, revenue is recognized on a proportional performance method based on the labor hours completed compared to the total estimated hours for the scope of work with contract and revenue accrued or deferred as appropriate. Cost of revenue associated with professional services includes the compensation, benefits, and other costs associated with our delivery and project management engineering team, as well as costs charged by subcontractors. Revenue for managed services: Revenue for managed services is generally recognized on a straight-line basis over the term of the arrangement. We may incur upfront costs associated with professional and managed services including, but not limited to, purchasing third-party support service arrangements, and software licenses. These costs are initially deferred as prepaid expenses or other assets and expensed over the period that services are being provided as cost of revenue. In addition, cost of revenue includes the compensation, benefits and other costs associated with our managed services engineering team, costs charged by subcontractors and depreciation of the software used to deliver our managed services and managed cloud contracts. contracts to the sale of hardware and more successful renewals of expiring contracts have a significant favorable impact to our gross margin percentage. Our service gross margin is primarily impacted by our ability to deliver on fixed price professional services engagements within scope, the ability to keep our delivery engineers utilized and the hourly bill rate charged to clients. The complexity of the solutions sold to our clients may require specialized engineering capabilities that can favorably impact the bill rate we charge. Our service revenue and cost of revenue also includes third-party services. Generally, a higher mix of professional services delivered by our delivery engineers has a favorable impact on service gross margin. In addition, our managed services gross margins are favorably impacted by our ability to negotiate longer contracts with our clients, as well as renewing contracts at a high rate, which improves our operating efficiency. Generally, a higher percentage of our overall revenue relates to services sold to our clients when the technology complexity of our solutions increases. Accordingly, our gross margins are favorably impacted by our ability to deliver more complex solutions, which include professional and managed services. Operating expenses: Our operating expenses include selling expenses, general and administrative expenses, transaction costs and depreciation and amortization. Selling expenses are comprised of compensation (including share-based compensation), variable incentive pay and benefits related to our sales personnel along with travel expenses and other employee related costs. Variable incentive pay is largely driven by our gross margin performance. We expect selling expenses to increase as a result of higher gross margin, as well as continued investment in our direct and indirect sales resources. However, we expect selling expenses to decline as a percentage of our total revenue. General and administrative expenses are comprised of compensation (including share-based compensation) and benefits of administrative and operational support personnel, including variable incentive pay and other administrative costs such as facilities expenses, professional fees and bad debt expense. We expect general and administrative expenses to increase due to our growth, however, we expect general and administrative expenses to decline as a percentage of our total revenue as we realize the benefits of scale. Transaction costs include acquisition-related expenses (such as stay and retention bonuses), severance charges, advisory and diligence fees, transaction-related legal, accounting and tax fees, as well as professional fees and related out-of-pocket expenses associated with refinancing of debt and credit agreements. Depreciation and amortization primarily includes the amortization of acquired intangible assets associated with our acquisitions and depreciation associated with our property and equipment. Total interest and other (income) expense: Total interest and other (income) expense primarily includes interest expense associated with our outstanding debt. In addition, we include losses on extinguishment of debt and other noncash gains or losses within total interest and other (income) expense. Our management regularly monitors certain financial measures to track the progress of our business against internal goals and targets. In addition to financial information presented in accordance with GAAP, such as total revenue and net income, management uses Adjusted EBITDA and Adjusted Net Income (each of which is a non-GAAP measure defined below) in its evaluation of past performance and prospects for the future. Our non-GAAP measures should be considered in addition to, not as a substitute for, or superior to, financial measures calculated in accordance with GAAP. They are not measurements of our financial performance under GAAP and should not be considered as alternatives to net income (loss) or revenue, as applicable, or any other performance measures derived in accordance with GAAP and may not be comparable to other similarly titled measures of other businesses. These non-GAAP measures have limitations as analytical tools and you should not consider them in isolation or as a substitute for analysis of our operating results as reported under GAAP and they include adjustments for items that may occur in future periods. However, we believe these adjustments are appropriate because the amounts recognized can vary significantly from period to period, do not directly relate to the ongoing operations of our business and complicate comparisons of our internal operating results and operating results of other peer companies over time. Adjusted EBITDA - Adjusted EBITDA is a non-GAAP financial measure. We believe Adjusted EBITDA provides helpful information with respect to our operating performance as viewed by management, including a view of our business that is not dependent on (a) the impact of our capitalization structure and (b) items that are not part of our day-to-day operations. We define Adjusted EBITDA as net income (loss) plus (i) total depreciation and amortization, (ii) interest and other (income) expense, and (iii) income tax expense (benefit), as further adjusted to eliminate noncash share-based compensation expense, purchase accounting adjustments, transaction costs, other costs and earnings from disposed business. We define Adjusted EBITDA margin as the ratio of Adjusted EBITDA to Adjusted Revenue. “Total depreciation and amortization” equals the sum of (i) depreciation and amortization included within total operating expenses and (ii) depreciation and amortization recorded as part of cost of revenue within our consolidated financial statements. “Purchase accounting adjustments” include charges associated with noncash adjustments to acquired assets and liabilities in connection with purchase accounting, such as recognition of increased cost of revenue in connection with an inventory step up fair value adjustment, recognition of reduced revenue in connection with a deferred revenue step down fair value adjustment and recognition of increased office rent expense associated with a fair value adjustment to the liability associated with deferred rent. “Transaction costs” (i) of $20.6 million for the fiscal year ended June 30, 2016 includes acquisition-related expenses of $3.0 million related to stay and retention bonuses, $1.1 million related to severance charges, $8.7 million related to transaction-related advisory and diligence fees, $6.0 million related to transaction-related legal, accounting and tax fees in connection with the Presidio Acquisition and $1.8 million related to professional fees and expenses associated with debt refinancings; (ii) of $14.8 million for the fiscal year ended June 30, 2017 includes acquisition-related expenses of $7.4 million related to stay and retention bonuses, $5.2 million related to transaction-related advisory and diligence fees, $0.5 million related to transaction-related legal, accounting and tax fees and $1.7 million related to professional fees and expenses associated with debt refinancings; and (iii) of $10.8 million for the fiscal year ended June 30, 2018 includes acquisition-related expenses of $5.9 million related to stay and retention bonuses, $1.4 million related to transaction-related advisory and diligence fees primarily associated with the November 2017 secondary offering of our common stock, $0.6 million related to transaction-related legal, accounting and tax fees and $2.9 million related to professional fees and expenses associated with debt refinancings. “Other costs” (i) of $5.6 million for the fiscal year ended June 30, 2016 includes expenses of $3.4 million related to certain non-recurring costs incurred in the development of our new cloud service offerings, certain expenses of $0.5 million related to unusual office start-up development costs and certain unusual legal expenses of $1.2 million; (ii) of $4.8 million for the fiscal year ended June 30, 2017 includes $3.6 million related to certain non-recurring costs incurred in the development of our new cloud service offerings, certain unusual legal expenses of $0.9 million and $0.3 million related to severance, (iii) of $1.1 million for the fiscal year ended June 30, 2018 primarily related to severance charges associated with the retirement of our former Chief Financial Officer. “Income tax impact of adjustments” includes an estimated tax impact of the adjustments to net income at the Company’s average statutory rate to arrive at an appropriate effective tax rate on Adjusted Net Income, except for (i) the adjustment of certain transaction costs that are permanently nondeductible for tax purposes, (ii) the impact of tax-deductible goodwill and intangible assets resulting from certain historical acquisitions and further adjusted for discrete tax items such as the remeasurement of deferred tax liabilities due to state effective tax rate changes or the excess tax benefit related to share-based compensation activity. The accompanying consolidated financial statements have been prepared in conformity U.S. GAAP and Securities and Exchange Commission ("SEC") rules and regulations for annual reporting periods. The information contained below should be read in conjunction with our historical financial statements and the related notes included in this Annual Report on Form 10-K.
Total revenue increased $40.4 million, or 1.4%, to $2,858.0 million for the fiscal year ended June 30, 2018, compared to total revenue of $2,817.6 million for the fiscal year ended June 30, 2017 which was led by growth in Security solutions. Our revenue growth in the period was negatively impacted by net recognition of software subscription sales, and a 16% increase in backlog orders believed to be firm as of June 30, 2018 compared to the prior year period. Revenue from sales of product decreased $36.7 million, or 1.5%, to $2,336.5 million for the fiscal year ended June 30, 2018, compared to $2,373.2 million for the fiscal year ended June 30, 2017. The decrease was driven by the impact of net recognition of software subscription sales in the fiscal year ended June 30, 2018, partially offset by strong growth in Security hardware sales.